The A-League has come of age. Tomorrow’s derby at a sold-out Parramatta Stadium is perhaps the most anticipated domestic fixture in Sydney since the competition began in 2005. I was there the evening Sydney hosted its first ever A-League match, when ‘All-Night Dwight’ lit up the Sydney Football Stadium before one of the competition’s best-ever players in Archie Thompson equalised. Having grown up in the Hills District and spent a fair amount of my early adulthood in nearby Parramatta, I never felt like Sydney FC was anything but the club for me. I listened to a lot of local punk bands at the time – still do, in fact – in an era when bands with strong western Sydney roots like Last Nerve, Strength Within and Means To An End were dominating the local scene. I still remember picking up Last Nerve’s eponymous 7-inch EP and being surprised to see the Sydney Harbour Bridge on the cover, because to me those bands always represented the deep-seated sense of alienation at growing up in western Sydney. Those bands are all long gone – replaced in the perpetually churning cycle of Australian punk music – but many of the main protagonists are still kicking on. 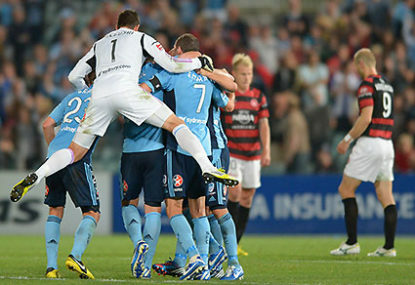 Likewise the addition of the Wanderers has changed the dynamic of the A-League for many football fans in Sydney. “Geographically and by my own set of rules, I’m now a Wanderers fan but my heart is yet to be won over,” former Last Nerve and current Vigilante vocalist Dave Immerz told me. Immerz, once a Sydney FC fan and a man of strong convictions – a quarter of the pre-order proceeds from Vigilante’s debut album “Quality Of Life” were donated to Sydney homeless shelter The Station Limited – is not an easily persuaded figure. His dilemma is echoed by ex-Strength Within guitarist and current Boneless bassist Matt Sourdin, who is still agonising over which club to support. “Having grown up in the western suburbs of Sydney, and playing for nearly 10 years for my local club, I was absolutely stoked when the A-League began and I had a team to barrack for – Sydney FC,” Sourdin said. As a Sydney FC fan, it’s a sentiment I appreciate. You can change your wife, as far as I’m concerned, but you can never change your football club. But for Sourdin, who grew up in Werrington and still calls the harbour city home, it’s a difficult decision to make. “Questions of loyalty to my beloved Sydney FC seemed to start arising as I saw a lot of my close childhood friends switch immediately to their new found ‘home team’ the Wanderers,” he explained. For Immerz, who has seen plenty of false dawns in more than 20 years of attending domestic fixtures, his allegiance to the Sky Blues wasn’t quite so steadfast. “Sydney FC is constantly changing, as expected to a degree, but not (to the extent of) eight coaches in nine seasons and a rotating chief executive position,” he said. That’s not to say he’s become a Parramatta Stadium regular, instead observing the Wanderers warily from a distance. Plenty of fans have already jumped on the bandwagon, though I’m certainly not one of them. I’ll be in the away stand supporting the Sky Blues on Saturday, just one of many football lovers from western Sydney somewhat bemused by the emergence of a wonderful club that will simply never represent me.